CAM Raleigh's June First Friday program includes after-hours access to the galleries, new hands-on activities at the creation station, music by local DJs, food trucks, and a suggested donation bar. 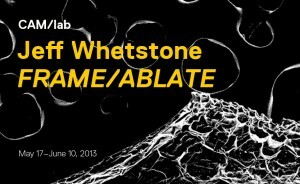 Join artist Jeff Whetstone for an artist talk at 8:00pm followed by a Q&A session regarding his video FRAME/ABLATE. This exhibition is part of the museum's exhibition program CAM/lab, which features short-run exhibitions of works-in-progress, promoting our guiding principles of being "freshly made, facing forward and changing together". The forum allows artists to display their works in a semi-formal manner outside of their studio. June First Friday is FREE thanks to the generous support of CAM Raleigh Board Member and Hughes Pittman & Gupton Partner Tim C. Gupton.